The history of the Berber languages has always been linked to that of other languages and cultures. It is a fact that, throughout history, the Berber peoples have handed down very few written documents in their own language. Even in ancient times, despite the widespread use of the Berber alphabet in North Africa, the Numidian kings preferred to employ in their inscriptions the language and script of the Phoenician settlers of Carthage alongside their own. Consequently, in those times and thereafter, the main historical sources regarding Berber have been written in the languages of those foreign peoples who have shared this area with the natives. As Mouloud Mammeri (1989) has pointed out, in Roman times, Latin was the language used by Tertullian, Cyprian, Augustine, Fronto, Arnobius, and Apuleius, even though the books of these writers provide clear evidence of their Berber origins. […] Since then and to this day, the situation has not changed. In all the countries where it has been spoken […] Berber has always remained hidden behind the scenes. […] For over three thousand years, Phoenician, Latin, Greek, Arabic, and French have been used in writing, but nobody has written in Berber. If on the one hand this situation is cause for much regret among those contemporary Berber people who would prefer a ‘national’ history less influenced by external narratives, it renders on the other hand Berber languages particularly interesting to linguists and sociolinguists because of their multifaceted nature due to contact. This volume includes most of the papers that were presented at the international conference Berber in contact – Linguistic and sociolinguistic perspectives held in Milan/Italy on 28–29 January 2008. It comprises a series of studies on different forms of language contact involving Berber both in North Africa and among the Berber diaspora. The fifteen articles are grouped into two main sections, according to the perspective from which the theme of contact is approached. The linguistic perspective focuses mainly on the analysis of contact effects on linguistic features and systems, while the sociolinguistic viewpoint primarily investigates the contexts of use of the different linguistic systems in contact. Le kabyle au contact des langues en présence en Algérie – Entre codeswitching et parler hybride? 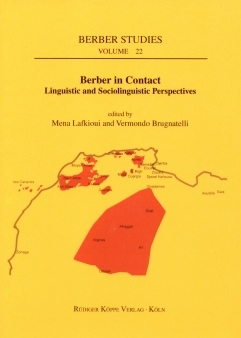 Summing up, the volume with its fifteen articles provides an interesting overview of current work on language contact and its impact on the language situation of Berber. It constitutes a valuable contribution to our understanding of specific details in various subfields, ranging from literature and sociology to aspects of language structure and typology. [...] As an overview over contemporary research on contact-related phenomena in Berber, it certainly fills a notorious gap.